Material: PVC copper cable , ABS Plastic and fireproof material. Power Cord Length: 6ft long / 1.8meters. Power Supply: AC 90V-125V (50/60Hz). Ports: 4 AC Outlets / 4 USB. Operation Temperature: 22°F - 129°F° (-30°C - 65°C). Storage Temperature: -22°F - 140°F (-30°C - 60°C). 1.Open App store(OS) or Google Play(Android) and search "Smart Life - Smart Living",Then Download it. 2. Open the Smart Life APP and Register your phone number or email. 3. Fill in the verification code that you have received and fill in the password. Sign in the APP. 4. Select the device type and click the "Electrical Outlet". 5. Long press the power button for more than 5 seconds until the indicator light begin to flash quickly (2 times per seconds).This means the device is already for configuration. 6. Open your APP and click the "Confirm indicator rapidly link". 7. Make sure that your device is close enough to your Wi-Fi router (The smart Wi-Fi devices only support 2.4GHz), enter your Wi-Fi password, click "Confirm" and it shows "Connecting Now". 8. If the device is connected successfully then the indicator light will no longer flash. Then you can control the smart plug to turn ON/OFF. 5. Control your devices using Alexa. Please note that your VeSync account is case sensitive, so make sure you have entered the right account in Alexa. Or they will tell you account doesn't exist. 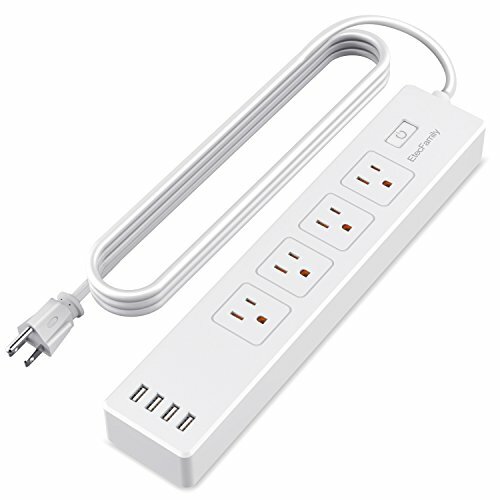 1 x Smart Power Strip. 【COMPATIBLE WITH ALEXA/GOOGLE ASSISTATNT】This EtecFamily wifi smart power strip will be voice controlled by amazon alexa and google assistant. 【USE SAFETY】This smart plug strip was made of UL-94-V0 fireproof materials, surge protector, overload protection, over-heated protection.CE & FCC & ROHS certificates. 【Remote Control】No matter where you are,You can control the power strip via Smart Life App(Apple user download form app store and Android user download from google play). 【TIMING FUNCTION】Creat customized schedule to automatically turn on and off any home Electronic applicance such as Lights, Lamps, air-conditioning, coffee maker and so on. 【NOTE】 Support 2.4G Wi-Fi network, DOESN'T SUPPORT 5G Wi-Fi presently. If you have any questions about this product by EtecFamily, contact us by completing and submitting the form below. If you are looking for a specif part number, please include it with your message.